Roe Rovers goalscorers from left to right Jack McGonigle, Lewis Moore, Sean McKinney and Joel Cromie. Claudy Rovers booked their place in the last sixteen of the Irish Junior cup after defeating Dervock 4-3 after extra-time. In the Premier Division, BBOB moved off the bottom of the table for the first time when they defeated Tullyally 3-2 with goals from Stevie Dougherty, Andy O’Keefe and Mick McCready. In the Matt Morrison Junior Cup, Donemana hit Eglinton for nine with Ricky Lee Dougherty scoring four. Limavady United Drummond needed extra-time to get the better of Draperstown, while Lisahally had an easy 4-0 win over Lincoln Courts. Foyle Wanderers thanks to goals from David Scanlon, Conor Kelpie, Ryan Wilson and Ryan Curry defeated Caw 4-0. Irish Street came from 5-2 down to beat Desertmartin Swifts 7-6 and Second Division leaders Ballykelly lost on penalties to Garvagh. There are four games in the Premier Division this Saturday, while Institute U20 take on Claudy Rovers in the Matt Morrison Junior Cup. The league leaders will be strong favourites to pick up another three points, they are going all out for the title, but have also cups to look forward to after a comfortable win over Lincoln Courts in the Junior Cup last week. The Old Boys finally moved off the bottom of the table after Saturday’s win over Tullyally, they know however that they need at least another three or four wins if they are going to avoid the drop, this doesn’t look like being one of them. The Wanderers are on a bit of a roll with a couple of victories they had four different scorers in last weeks junior cup game, although they lost leading marksman Robbie Godfrey at the beginning of the season they have rebuilt. Ardmore feel that they can still mount a serious challenge to leaders Lisahally, as they have games in hand, they put up a good show in their friendly defeat by Derry City last Sunday, which will have given them a lift. 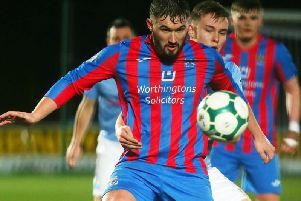 The home side bowed out of the Junior cup last week and they now can concentrate fully on mounting a serious challenge for the league title they know however that they can’t afford any slip ups with Lisahally on a roll. Tullyally look doomed their defeat by BBOB last Saturday mean’t that they are now at the bottom of the table and they don’t come much tougher than this one. The Roesiders had a good win in the Junior Cup and on their day they are a match for anyone in the division, their problem has been consistency, they will be strong favourites in this one. The Courts will be glad that their two games with Lisahally are gone as they suffered 2 heavy defeats, they are precariously placed in the league table and need a couple of wins urgently.